We sought to build a program that would best prepare trainees for any physical contingency—prepare them not only for the unknown but for the unknowable as well. The CrossFit prescription is “constantly varied, high-intensity, functional movement.” No aspect of functional movements is more important than their capacity to move large loads over long distances, and to do so quickly. The methodology that drives CrossFit is entirely empirical. We believe that meaningful statements about safety, efficacy, and efficiency, the three most important and interdependent facets of any fitness program, can be supported only by measurable, observable, repeatable facts; i.e., data. We call this approach “evidence-based fitness.” The CrossFit methodology depends on full disclosure of methods, results, and criticisms, and we’ve employed the Internet (and various intranets) to support these values. Our charter is open source, making co-developers out of participating coaches, athletes, and trainers through a spontaneous and collaborative online community. CrossFit is empirically driven, clinically tested, and community developed. In implementation, CrossFit is, quite simply, a sport—the “sport of fitness.” We’ve learned that harnessing the natural camaraderie, competition, and fun of sport or game yields an intensity that cannot be matched by other means. CrossFit increases work capacity across broad time and modal domains. This is a discovery of great import and has come to motivate our programming and refocus our efforts. This far-reaching increase in work capacity supports our initially stated aims of building a broad, general, and inclusive fitness program. The modest start of publicly posting our daily workouts on the Internet beginning six years ago has evolved into a community where human performance is measured and publicly recorded against multiple, diverse, and fixed workloads. As always you state your case well Coach, my question is do you see any application for consistency within this varied program? I personally make a disctinction between what training is and what practice is, please do correct me where I may err Coach as this relates to this program in particular. I'm interested in learning more yestarday!! You guys coming near Indiana to do certifications any time soon?? I was just wondering if this program is designed to supplement an existing workout program? Or is it used as a stand alone program. I am a M/51/6'/190. Looking for strength training plus endurance. I'm in Brazil and I would like to know more about open a Crossfit Studio here. To all that have posted here. CrossFit is used to supplement others in their sports and jobs. It also stands alone is considered by many to be their sport. Any information about certifications can be found on the main site on the right hand column. The fill up quick so if you see one that works for you I would book it right then. If you would like to open a CrossFit affiliate you will need to attend a certification, and apply for affiliation. This info can be found on the upper left hand column of the main page. You would not really want to supplement this with other workout programs. This is a workout program and a very effective one. Other programs usually call for isolated muscle movements and CrossFit does not support these movements as they are not functional and you put yourself at risk for injury. My suggestion to all of you is do the Workout of the Day on the main page for a few weeks, read everything, join the message board, then if you are hooked like the rest of us you can go to a certification or find a local affiliate so you can preform the WODs with others. For information to scale or any questions on what a exercise is refer to the FAQ on the left hand column. Also click on the Start Here in the left hand column to find a link to Brand X where you will find scaled workouts if you do not think you can do the posted exercises. Any questions you can email me or ask it in the message board. Remember to do a search on the board before posting as your questions has probably been answered. I hope this helps anyone seeking information about CrossFit. As 69 year old Master's athlete, located in Dayton Ohio, who has been doing the pole vault and other events including the Decathlon at track events around the country for the last 12 years, I find your concept of functionality exactly what I do. I have done some coaching of younger athletes at the college and high school level in the pole vault and find that, though they are fit, they are still weak where it counts - core, tricepts, labs, etc. These athletes are forced to use the gyms available at the schools and are forced to do all the routine lifting, etc. that a trainer prescribes. In several cases the girls were doing workouts a football player would do, not a vaulter. What can I do for myself and for these young athletes with regard to your methods of development? Is there anything going on here in the Southwest Ohio area? 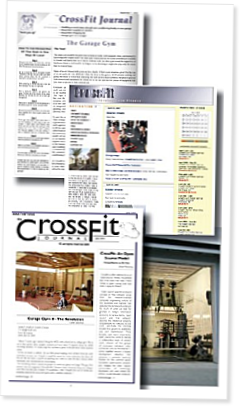 Can you please tell me how I can find a CrossFit class near Anaheim California? Thank you, (714) 814-6871 Brian please don't worry about calling too late or too early! If you go to the main page and look on the left you'll see an affiliates blog, on the left of that page is a listing of affiliates by state. Under CA, you'll see that there is a CrossFit in Buena Park. If you click on the name it will take you to their home page and under contact you will find the address. That's probably the closest you'll get to Aneheim. Good luck. We ended up opening our space in Rancho Santa Margarita due to finding a space that would allow us to operate in Ladera. Saludos de Venezuela, e comenzado con un grupo de amigos ex gimnastas, artistas marciales y rugbistas con trabajos en circuitos para un trabajo completo de todos los grupos musculares. incluimos trote y sprint. La veredad es que nos ha ido excelente en apenas un mes mejorando nuestros registros y cronometros y aumentando progresivamente el nivel de dificultad de los ejercicios. Crossfith no es nada nuevo, solo que alguien se atrevio a levantar su voz en contra del monopolio existente por los grandes gimnasios y hoy tenemos esta nueva realidad.